I had to make this recipe again, just to be sure that I prefer to cook the cookies first and then “glue” them with jam. My family liked both versions. I liked this one better but I have to make one more correction next time. I want to make the cookies thinner. They become too big at this thickness. Clearly, a keeper recipe. Lots of butter on the downside but no sugar on the upside, easy dough, also suitable for kids to decorate if you don’t want to use jam and double them up. How to make: Use a mixer to beat the butter with the cream cheese at medium speed. Add the flour one cup at a time. Shape the dough into a ball, wrap it with cling film and let it rest in the refrigerator for an hour. Sprinkle the surface you will be using to roll the dough with some confectioner’s sugar. Roll the dough and cut the cookies. You can make them round or shape them with cookie cutters. Place the cookies on a baking sheet and cook them at a pre-heated oven at 375F/190C for about 15-20 minutes (depending on your oven), until lightly golden. Let them cool off. Put about a teaspoon of jam in the center of one cookie. Place one more on top and squeeze gently to “glue” them. Dust plenty of confectioner’s sugar on top and serve! Notes and tips: If you leave the dough in the refrigerator for much more than an hour, it will become very hard. You will need to let it stand in room temperature until it softens again and that can take a few hours depending on the temperature of your house. 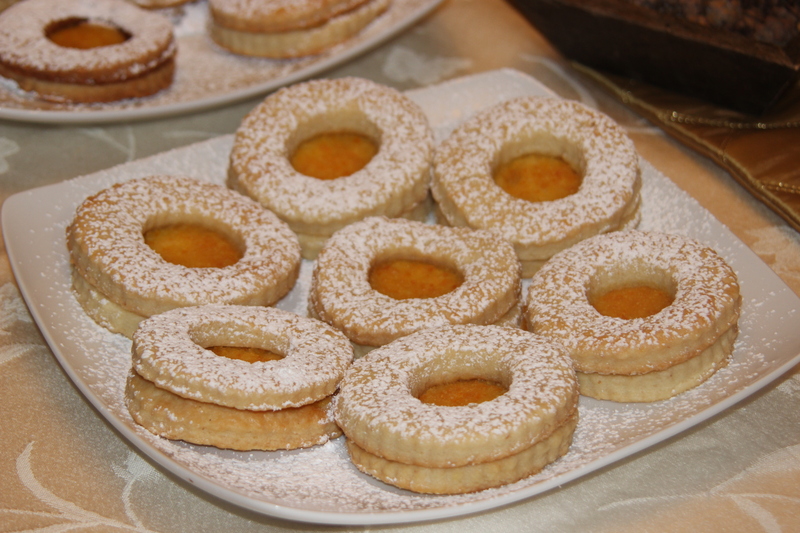 Here’s another version of the Hungarian treats basic recipe that is in turn a small variation of “Biscuits with apricot and strawberry jam“. I made this version with the kids to celebrate Christmas 2013. For this festive occasion, we used all-purpose flour instead of whole wheat and the home made orange jam that I made couple of months ago. The jam came out a bit bitter because I kept all the skin without pre-processing it but it went really well with these cookies. Even though you thought the cookies were too big, I loved them!